FRONT TINE TILLER 5HP Rentals Ft. Collins CO, Where to Rent FRONT TINE TILLER 5HP in Ft. Collins, Wellington, Greeley, LaPorte, Loveland, Windsor CO and all of Northern Colorado. Excellent Garden tiller, mixes the soil, will dig deep, and is easy to use. Weight 145 lbs, Honda 5.5 hp engine. 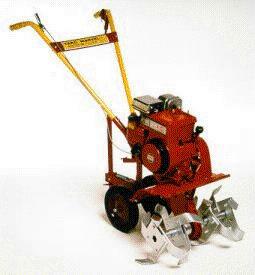 Tine width is 24"
This tiller is recommended for gardens and smaller areas. For large areas and hard packed ground use our Rear Tine Barreto Tiller. * Please call us for any questions on our front tine tiller 5hp rentals in Fort Collins, Wellington, Greeley, LaPorte, Loveland, Windsor CO and all of Northern Colorado.